The filter is an accessory (after-market) speciali developed for our Green Blow products that is applied, in a very simple and quick way, to suction case side using a metal band. There are three different filtration classes available, on the basis of the dimensions of the blocked particles (G3/G4/M5). Higher filtration class means also greater size/weight of the filter. 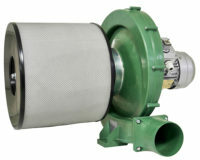 The filter with higher filtration class (see photo) has a weight of 4,4 kg which counterbalances the weight of the motor to the other side increasing the overall balancing of the blower. The filter is compose by a strutture in black powder-coated steel sheet. The internal filter element is contained by two welded-meshes galvanized white, such as to reduce the formation of rust. The internal filter element, that could be replaced, is realized in sithetic fiber. The filter for Green Blow is the first accessory of a wide range that will be launched in the next coming months and which will be presented in its entirety at Tecnargilla. The Air Line accessories will be enriched with other components that will facilitate installation and application to any existing system and/or production environment. Keep updated following our social channels.